For all those budding freestyle riders who’ve been training hard for years and dreaming of the chance to stand on the start line at Crankworx, the world’s biggest gravity mountain bike festival is offering one lucky rider the chance to ride alongside the international elite at the Oakley Official Alpine Whip-Off Championships presented by SPANK in Innsbruck. All you have to do is take part in the Crankworx Innsbruck Video Challenge. The competition is open to everyone aged 16 years and above – be it local MTB legends, up-and-coming young guns or international whip specialists. Sounds like your jam? Then grab your bike and a camera and get filming now! Show us your best whip! The video should be a short clip (no longer than 60 seconds) of you performing your best whip. The video should be in a Vimeo, YouTube, Instagram or Vine format and be submitted from 11.05.2018 to 24.05.2018. Our expert judges (General Manager of the Crankworx World Tour Darren Kinnaird, LINES editor in chief Christoph Berger-Schauer and slopestyle pro Peter Kaiser) will select the three best whips. Making it through to the first round will earn you some serious respect from your crew, but don’t celebrate too soon. The second stage is a Facebook vote from 30.5. to 4.6.2018. The video with the most Likes will win the coveted wildcard and the rider will have the right to ride at the Oakley Official Alpine Whip-Off Championships presented by SPANK on 13 June at Crankworx Innsbruck. For more information visit the Crankworx Innsbruck 2018 Facebook Event page. “We are really stoked to be able to give away a wildcard this year and can’t wait to see all the videos with the best whips. Of course, the chance to ride with the world’s best freestyle mountain bikers is a unique opportunity, but this challenge primarily addresses experienced athletes,” says Georg Spazier, head of the organizing team behind Crankworx Innsbruck. 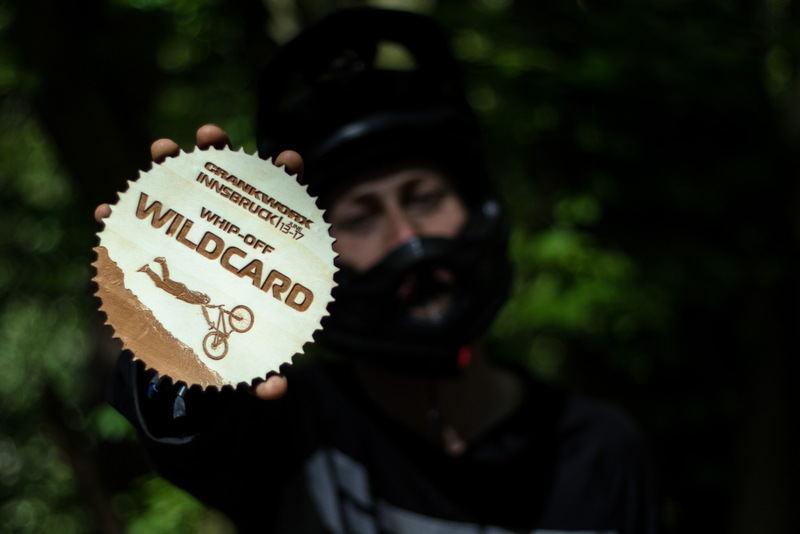 The Crankworx Innsbruck Video Challenge is not the only route to a wildcard for this year’s Whip-Off Championships at Crankworx Innsbruck. The winners of the whip-off event at the iXS Dirt Masters Festival in the Bikepark Winterberg (12 May) and the Austrian Whip Offs in the Bikepark Schladming (19 May) will also receive a wildcard for the Oakley Official Alpine Whip-Off Championships presented by SPANK at Crankworx Innsbruck. ‘Pump for victory’ is the name of the game not only at Crankworx Innsbruck in June but also at this year’s third edition of the Austrian Pumptrack Series. The event on 26 May will take place on the original Crankworx Innsbruck pump track in the Bikepark Innsbruck. The three fastest men and the fastest woman will all receive a wildcard for the RockShox Innsbruck Pump Track Challenge on 14 June at Crankworx Innsbruck. For more information visit www.crankworx.com/festival/innsbruck and follow us on Facebook, Twitter, Instagram and YouTube.